In my anthropological research in academic libraries, and in higher education generally, I have encountered a contrast between the ways that institutions approach the information systems they build and buy, and how people use those systems. Confronting the ‘mess’ of people’s everyday practice is a necessary first step towards more effectively connecting people to the resources they want and need. Here I discuss some of the ways to visualize and embrace the actual practices of people, in physical and digital contexts. Qualitative approaches to users, libraries and institutions as a whole force us to pull back and think about the bigger picture. Ethnographic approaches do not allow our world to be reduced to the tool or to the piece of code; they force us to think about the ways in which our work is embedded in the wider world and in the wider set of people’s practices.1 I have spoken and written about this before in terms of ‘mess’,2 by which I mean the uncontained, multimodal and many-sited practices in which people engage as a part of their everyday lived experiences as students, researchers and teachers in academia. I find the notion of messy practice a necessary counter to the normalizing narratives of practice that assume things can be neatly described, measured, counted and contained within institutional boundaries, both physical and organizational.3 In this article I want to explore ways that I have tried to capture mess in my anthropological research into academic practices, and why I think it matters to pay attention to it. Institutional practices are increasingly situated within digital places and digital tools. Now that the shift has largely taken place from exclusively analogue to increasingly digital practices, there seems to be a notion that everything is also moving towards a ‘one-stop shop’. We need to ask ourselves why that is. What is communicated to users, by vendors in particular, when they say, ‘Come here and do all your stuff’. In practice, that never happens, and the notion that ‘everything is in one place’ is rarely anyone’s motivation for engaging with a tool, system, or digital place. Practices are spread across multiple tools and multiple places – and still, by the way, include analogue.4 One motivation from vendors and institutions around trying to push a one-stop solution is that it would facilitate more comprehensive gathering of analytics data. Once someone logs into a system, the more they have to do within the system, the more data can be automatically gathered. Institutional systems that require log-ins (and that facilitate comprehensive analytics gathering) enforce the closed-gates model of academia, enforcing that you have to be a member, you have to be a part of the academic community that pays for the resources to be able to have access to them; institutionally held resources are gate-kept, they are controlled. These traditional models of academic practice that have been migrated to digital also preserve the importance in academia of hierarchy. The hierarchy is not just preserved in the controlling of access to resources, but even in the splintering of academic websites into personae. As soon as there are categories in library websites, for example, that specify ‘graduate students’, ‘faculty’, ‘undergraduates’, etc., you have embedded the hierarchy of your institution into your web practice. The notions of credibility that come out of these traditional institutional settings are familiar to us. We think that we know what it means when we say that somebody is credible, because they have a PhD and because they published in that journal, because their work is cited by these people.5, 6, 7, 8 This form of credibility generated by institutional systems is something that is controllable, and also quantifiable in particular ways (e.g. in the Research Excellence Framework [REF]). Closed practices generate very particular models of institutional belonging, in sharp contrast to the lived experience of academics, which is decidedly not closed, and rarely, if ever, bound to one particular institution for their entire scholarly career. We need to pay attention to this lived experience, which provides a counter to closed models of institution practices. This is the difference between the student experience, where ‘I did a degree in anthropology’, and the ‘lived experience’ of a student, which is, ‘I lived on campus for a year and so I could walk to my classes and because I lived near the beach it was really nice, but then the dining hall was across the way and so I had to walk over there and it was difficult to get my resources, and I didn’t really like working in the library that much ‘cause it wasn’t close to all the places where I needed to go.’ All of those details, all of those little decisions that students have to make about where and why and how they work, that comes out of their phenomenological experience of being a person – we cannot get to these sorts of things with analytics and systems. We have to get to this kind of information by engaging in practices that bring us in contact with people. We have to talk to them, we have to observe them, we have to ask questions, we have to not just take their word for it when they say they do something, but we have to dig deeper and find out what they actually mean when they say, ‘I studied in the library’. Those words are nested, embedded with meanings. What do they mean by ‘study’? What do they mean by ‘library’? 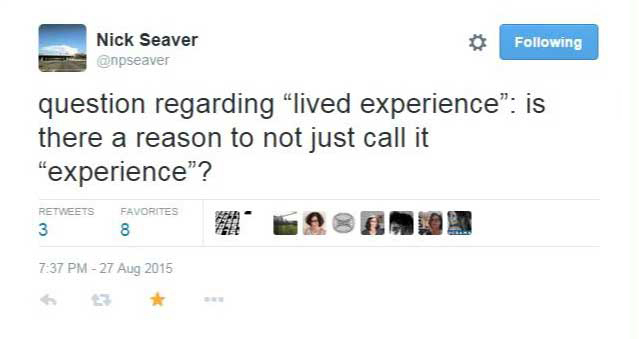 This, then, is the difference between the ‘experience’ and the ‘lived experience’: experience is a neat thing, that we can think we know the meaning of, while as soon as you start talking about the ‘lived experience’, things get messy. One of the ways that I try to capture the mess of the academic experience is with cognitive maps.10 In this exercise, participants sit down and for six minutes, draw all of the places that they learn. There is a lot of movement in the map that is Figure 2. 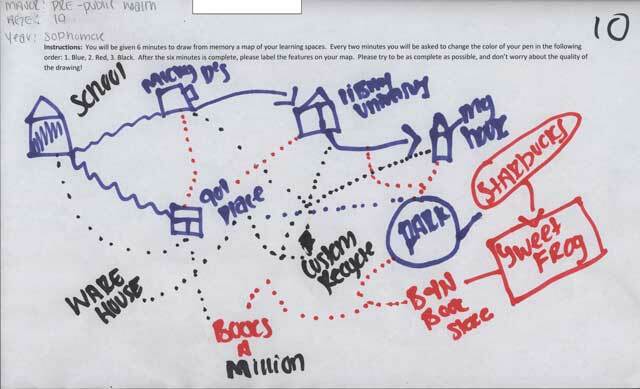 This is a map from the University of North Carolina (UNC) Charlotte, and this student has mapped spaces that go from North Carolina all the way down into South Carolina. They are on-campus spaces, off-campus spaces and residential spaces. There are restaurants, apartments, and the student is clearly not institutionally bounded. All of the places that this student needs to be are not necessarily UNC Charlotte spaces, but these are all of the spaces that they see themselves going to when they are doing what they need to do for their degree at UNC Charlotte. 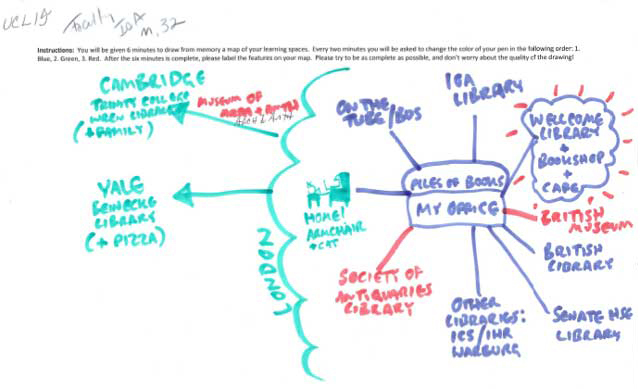 The map in Figure 4 is from a member of academic staff at UCL. His learning spaces include places like Yale. The important thing about Yale is less the library, which is a nice library, but the pizza. He goes to Cambridge not just because Cambridge is important, but because his brother is there, and he probably would not involve Cambridge in his sense of learning spaces quite so much if it were not for the connection with his brother. His representation of his home-office includes his cat. When thinking about systems that libraries build or buy, and the resources these systems are ostensibly trying to get into the hands of students and other academics, it is crucial to also think about these larger contexts. The users of these systems and resources are not just sitting at a desk in an office. They are not just sitting at a table in a library. They are on a bus, they are in a park, they are in their bedroom, or they are in a variety of different libraries, not just the library that is disciplinarily ‘appropriate’ to their work, but in libraries where they either know people and so they are comfortable there, or in libraries where they do not know anybody so that they will not be disturbed. There are all of these human reasons for engaging or not engaging with spaces and information. I am particularly happy with the cognitive mapping instrument because it only takes six minutes for the map to be drawn, and it serves as the basis for a conversation, where I have the opportunity to draw out why and how what they have drawn is important to them. You can visit and revisit maps and interviews like this for a very long time. They are a tremendously rich source of information, and not something that is available via systems analytics. When thinking about these human-scale, messy practices, we have access to this other set of things that are important. People engage in ways and places that are not necessarily bounded or defined by the institution. People exist in communities that might be larger than any given institution; people’s identities are a series of nesting circles, and which particular part of their community they are engaging with is going to transform what they do and why. As ubiquitous as screens are, they are embedded in a material culture that is not just digital, and we have to pay attention to that.12 It matters what kinds of spaces people choose to sit in when they pull out their screen and interact with something else. It also matters what people are trying to do when they are online. Many times they are not just connecting with resources, not just getting information, but actually having conversations. The engagement that happens on the resident web13 is different from operational purposes such as using search engines to find information. The reasons that people are where they are in digital places are deeply entwined with their human experience. 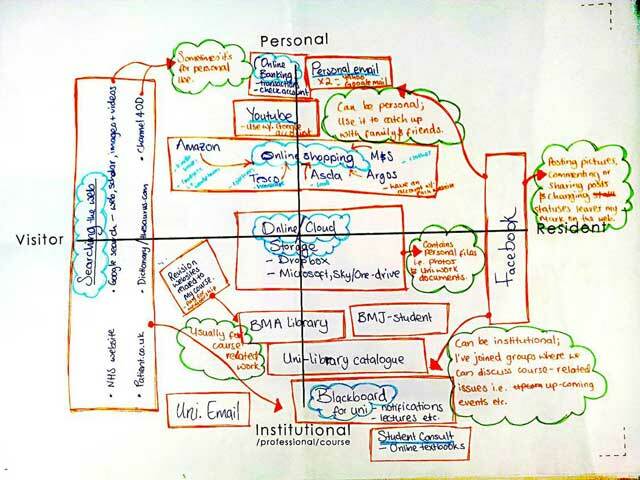 Maps like the one in Figure 5 are effective at getting people to visualize their practices; in the same way that the cognitive maps were about visualizing the learning landscape of people, these maps can give us a sense of where people are digitally, what they are doing and why. They are frequently messy maps, with institutional and personal practices mixed together, or in multiple places on the maps. Figure 6 provides another nice example. Institutional pieces such as e-mail and virtual learning environments (VLEs) show up, Google and Twitter, shopping and personal interaction, as well as academic and work lives. It is important to note here that not everybody who is on Twitter (or in any other such environment) is using it in the same way. There are people who treat it like an RSS feed, there are people who treat it just like a stream of information, and then there are other people who treat it like a cocktail party, or treat it like a conference – in these latter two cases, the reason they are on Twitter is for the people. What this means is when institutions want to know the numbers for how many people have social media accounts or how many people have personal e-mail addresses as opposed to just the institutional addresses, those numbers do not reveal what people are doing with those tools, or in those digital places, or why they are there in the first place. When someone draws a map, it can give an initial sense of what they are doing, but the important part is the conversation that comes after the mapping is complete. It is in the conversation where they say, ‘This is why I’m there. I’m on Facebook because all of my family are on Facebook and they would kill me if I didn’t have a Facebook account, and I hate going on Facebook because it’s like going back to my home town, and then I have to deal with all of these people who I don’t agree with.’ ‘I would rather be on Twitter’, students say to me sometimes, ‘because I can choose who I have a conversation with’. Engagement is not about the tool, it is about the people. While the tools shift and change, the motivations that people have and the decisions that they make around why they are there, that is something that we can really dig into. One of the really effective things about using mapping as a technique to try to get at practice is the potential it then opens up for people to discuss the ways in which they would like to move their practices. Libraries and the people who work in libraries are also invested in educating people to be capable of making good decisions about what they do, asking questions like, ‘Why are you using that piece of information?’, ‘Is that the piece of information that you really need?’, ‘Is that tool going to do what you think it’s going to do?’, ‘Are you capable of thinking about whether or not that is a good thing to do and making the right kind of decision?’ As soon as people draw their practices, they start thinking, ‘Is that really what I want to do? Do I really want to be spending that much time sending e-mails that nobody reads? Maybe I could think about other ways of trying to engage with people and communicate.’ Again, it is not about the mapping per se, it is the conversation that you get to have after you do the mapping that is the more important. In workshop and other professional and academic development contexts, these techniques are not just about learning what people are doing and why, but about generating reflexive moments for individuals to sit back and recognize what they are doing, and see potential in doing something else. 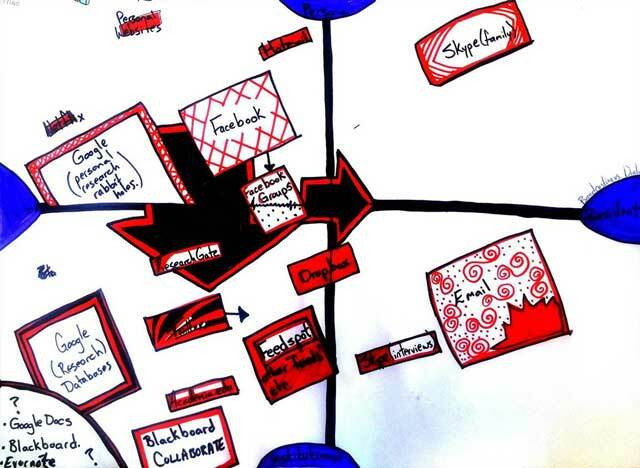 The map in Figure 7> shows the results of a participant drawing their intentions to change what they are doing in their practice. Part of the reason that I was hired by my library was to enable them to have a sense of what people are actually doing, so then if we wanted to try to drive practice in particular ways, we would be starting from a grounded position, rather than assuming (for example) that we know what they are doing, because they have x tool loaded on their laptop. These are powerful moments that can only come to us by engaging in qualitative research, in qualitative ethnographic interest in the practices of people. These moments do not emerge from data reported in analytics dashboards. We also want to know what motivates people, because if we build tools without any sense of what their motivations are, they will not use them. You can build the most beautiful system in the world, and if you have not paid attention to why anybody would want to engage with what you just built, it is useless. Even if you know more than your users do, using information like this can actually connect with what they want to do, regardless of what you think they should be doing. In libraries we talk a lot about what ‘they should be’ doing. If they do not use a database, or some other theoretically useful resource, it is just as much our problem as it is theirs. In fact, it might actually be more our problem that they are not using our resources. If practice is this messy and this unbound and if people really do not care that much about where they are getting their information, what is the role for something like a serial, or databases? People look for articles, people look for books, even academics who have been professors for years are using journals as consumers far, far less than they are using these individual units. In fact some students attempt to cite the databases that they use, because they are unclear on what that whole sort of ‘journal’ thing is. The journal is a unit that is important in terms of identity, for scholars who are producing a body of work. Discussions around open access that require a different approach to journal production, publication and revenues can feel very threatening to academic organizations, who depend on the money and on the anchor for particular academic identities. They are less concerned about it because of the content of the journal; they are concerned about it because having that journal is a part of their identity as scholars. That kind of motivation is distinct from the one that someone would have to read an article – the identity politics of the role of journals in academia is something that gets mixed in with conversations about where and how we publish. When people talk about where they find information, even if they have been academics their entire lives, they often talk about searching in the same kind of terms that their students talk about it, students who have not been doing this for a very long time: they talk about browsing via Google, very rarely via Google Scholar.14 This is not something that is new to anybody, but it is something that we persistently ignore when building systems, assuming that users go to library websites, and then they find everything they need. But they do not start at the library website,15 and they have not done for a very long time. In thinking about all of the systems that are built and sold and offered, it is crucial to consider the fact is that everybody’s practices are embedded in the much larger context of the open web. If people just use what they need to, regardless of institutional affiliation (see, for example, discussions about SciHub),16, 17 we should start having conversations about why the resources are closed. How much of what any institution has, or produces in terms of scholarship, is behind passwords and paywalls? What if we asked more about why we have closed as the default, rather than open? If that information is so important, why is it also important to limit the number of people who can have access to it? There may be very good reasons for that, but they tend to be unspoken, and in an environment where academia is under scrutiny we need to articulate our reasons for closing access. I would suggest, in fact, that many of the reasons for closed practices emerge from concerns about traditional academic measures of prestige, which remain tied to metrics such as journal impact factor (although this is shifting, particularly in non-STEM fields).18 The reasons that academics are concerned about closed systems within which to place their scholarly content (e.g. in journals and books that are not open access) are tied to these traditional notions of prestige, and concern about career advancement, interestingly, separate in many ways from the priorities of scholars as consumers of knowledge. When we make our own practices visible to ourselves, we have a much better chance of being clear about why we are doing something, instead of just assuming that ‘this is the way we should be doing it’. The question I am always asking in my research comes fundamentally from my approach as an anthropologist:19 ‘What are people doing?’ Not, ‘What do we think they are doing?’, not ‘What do we think they should be doing?’, but, ‘What are they doing?’ As soon as you get a picture of what they are doing, then the really interesting explorations of why they are doing that become possible. Everybody always has a rationale, a motivation; and we don’t have to throw up our hands and say, ‘I don’t know why students are doing that’. Have the conversations with students and you gain an insight into why they behave in particular ways. 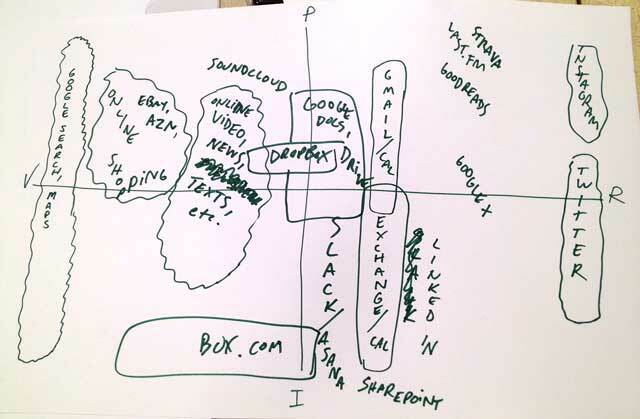 All of the people who drew maps of their digital practices in this paper had very good reasons for doing what they were doing online. Nobody was unclear about why they have a Facebook account. Nobody was unclear about why they are using Twitter. It is rare to have a person say, ‘I have no idea why I have an e-mail account’. Everybody knows why, but they do not always get asked, and they are not used to talking about why. Institutions need to start confronting the fact that staff and students are often agnostic about institutional priorities around practice. Institutions default to wanting controlling systems, for things to be visible and contained. But the implications of messy practices like the ones I discuss here are that sometimes you cannot see what is going on, sometimes students are going to go and use something from a system that was not recommended, and sometimes one that was advised against. Some of the implications of messy practices are that they are uncontrollable. Institutionally unbounded practices are messy and unpredictable, and they are much more interesting practices to engage in. In fact, I would argue that it is our responsibility to recognize the effectiveness of those practices. Institutions would be served better by engaging in far less locked-down control of scholarly content, because any sense of control that they have is an illusion in the first place. We do not have to control people’s practices to be able to equip them to be effective practitioners. We do not have to control people’s practices to be able to equip them to be well-educated citizens who are capable of making good decisions. Thank you to the UKSG organizing committee for the 2016 Conference for inviting me to present in a plenary session, and to Ken Chad for suggesting me to them. Thanks as well to colleagues face to face and on Twitter who helped me with content and citations for this reworking of the talk I gave – all mistakes herein are officially my own. All maps collected and photographed by myself or David White. Priestner, A and Borg, M eds. (2016). Routledge. Lanclos, D M (2015). ‘Messy Processes: Implications for building information systems of academic behavior on the open web’. https://youtu.be/MMK_HVcK17s (accessed 20 August 2016). Lanclos, D M (2015). 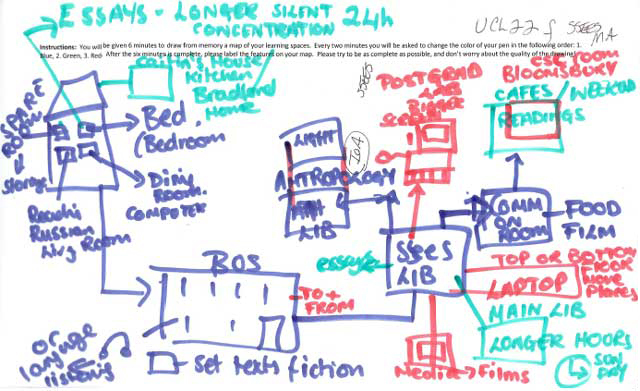 networkED: The London University, Anthropologist in the Stacks blog. Sept 28 2015 http://www.donnalanclos.com/?p=418 (accessed 20 August 2016). Gourlay, L, Lanclos, D M and Oliver, M (2015). Sociomaterial texts, spaces and devices: questioning ‘digital dualism’in library and study practices. Higher Education Quarterly 69(3): 263–278, DOI: https://doi.org/10.1111/hequ.12075 (accessed 20 August 2016). Lanclos, D M and White, D (2015). The Resident Web and Its Impact on the Academy. Hybrid Pedagogy, http://www.hybridpedagogy.com/journal/resident-web-and-impact-on-academy/ (accessed 20 August 2016). Calver, M C (2015). Please don’t aim for a highly cited paper. The Australian Universities’ Review 57(1): 45–51. http://www.nteu.org.au/women/article/Please-don%E2%80%99t-aim-for-a-highly-cited-paper.-By-Michael-C-Calver-(AUR-57-01)-17445 (accessed 20 August 2016). Goodman, J E, Tomlinson, M and Richland, J B (2014). Citational Practices: Knowledge, Personhood, and Subjectivity. Annual Review of Anthropology 43(1): 449–63, DOI: https://doi.org/10.1146/annurev-anthro-102313-025828 (accessed 20 August 2016). Todd, P A and Ladle, R J (2008). Hidden dangers of a ‘citation culture’. Ethics in science and environmental politics 8(1): 13–16, DOI: https://doi.org/10.3354/esep00091 (accessed 20 August 2016). Murphy, K (2015). kmtam: a curious collection of fancy-strikers. August 28 2015 http://kmtam.tumblr.com/post/127816517140/on-twitter-the-other-day-nickthings-asked-about (accessed 20 August 2016). Asher, A and Miller, S (2011). So You Want to Do Anthropology in Your Library? : A Practical Guide to Ethnographic Research in Academic Libraries In: ERIAL Project. http://www.erialproject.org/wp-content/uploads/2011/03/Toolkit-3.22.11.pdf (accessed 6 October 2016). Smale, M A and Regalado, M (2014). Commuter students using technology. Educause Review Online, http://er.educause.edu/articles/2014/9/commuter-students-using-technology (accessed 20 August 2016). Gourlay, L, Lanclos, D M and Oliver, M (). ref. 4. Lanclos, D M and White, D (). ref. 5. Connaway, L S, Lanclos, D M and Hood, E M (2013). ‘I always stick with the first thing that comes up on Google…’ Where People Go for Information, What They Use, and Why. Educause Online Review, http://er.educause.edu/articles/2013/12/i-always-stick-with-the-first-thing-that-comes-up-on-google---where-people-go-for-information-what-they-use-and-why (accessed 20 August 2016). Dempsey, L (2014). The network reshapes the library: Lorcan Dempsey on libraries, services and networks. American Library Association. Smith, K (2016). Some Radical Thoughts about SciHub, Scholarly Communications @Duke blog. March 3 2016 http://blogs.library.duke.edu/scholcomm/2016/03/03/some-radical-thoughts-about-scihub/ (accessed 20 August 2016). Crissinger, S (2016). The Time is Now: Scholarly Communication and Undergraduates In: ACRLog. June 28 2016 http://acrlog.org/2016/06/28/scholcomm-undergrads/ (accessed 20 August 2016). Lanclos, D M (2014). The Mixed-Method Library: Qualitative Research and the Future of Assessment in Higher Education. Reinventing Libraries: Reinventing Assessment. Innovative Practices and Ideas that Challenge the Status Quo, CUNY Library Assessment Conference Proceedings. http://www.cuny.edu/libraries/conference/proceedings/DMLtalkCUNYLib2014proceedingsLanclos.pdf (accessed 20 August 2016).